Published: March 6, 2012 at 03:35 p.m. It's Super Tuesday, everybody. 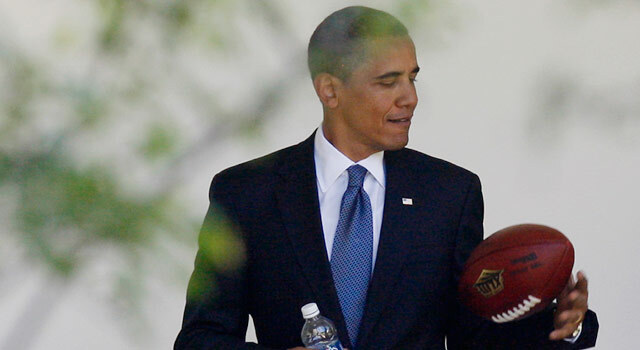 Sports and politics have always mixed -- especially football. And it goes beyond the gratuitous visit to the White House after winning a championship. Presidents Dwight D. Eisenhower, Gerald Ford and Ronald Reagan played college football. Ford, in particular, was quite the football player -- selected as the University of Michigan's MVP in 1935. Even Barack Obama has repeatedly called out for an end to the current BCS system (which is change we really can believe in). But as it turns out, the NFL has jump-started some political careers. With that in mind, here's a look at six former NFL players who have made the biggest impact in politics. James was a 1986 Pro Bowl selection as a member of the New England Patriots, and he went into broadcasting after his playing days. James announced late last year he's running for a U.S. Senate seat in Texas. Runyan last played for the Chargers in 2009 (after a long career with the Oilers, Titans and Eagles), but wasted little time getting into politics. He won election as U.S. Representative for New Jersey's 3rd congressional district in 2010. Largent held nearly every major receiver record when he retired from the Seahawks in 1989. He went on to serve as a congressman representing Oklahoma from 1994 to 2002. He lost a bid for Governor of Oklahoma in 2002 and hasn't served in public office since. Shuler was taken third overall by the Redskins in 1994, but ended up as one of the league's biggest busts. Shuler found more success in politics, where he was elected the U.S. Representative for North Carolina's 11th congressional district in 2006 and still maintains that post to this day. Kemp led the Bills to two AFL titles and was selected league MVP in 1965. He was the U.S. Representative for Western New York's 31st congressional district from 1971 to 1989, but is probably most well known for being the 1996 Republican Party nominee for Vice President (on the ticket with Bob Dole). Page was a member of the Vikings' "Purple People Eaters" of the 1970s and also attended University of Minnesota Law School and earned his J.D. in 1978, which led to him being elected an Associate Justice of the Minnesota Supreme Court in 1993 -- a post he still holds. He was the first African-American to ever serve on that court.